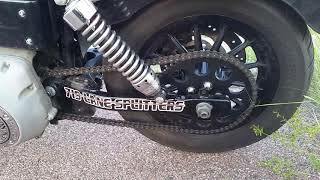 Ditch that belt and go with a traditional 530 rear drive chain setup on your 2006 & Up Harley-Davidson Dyna Twin Cam. This chain conversion kit keeps the same gearing ratio as your stock drive belt setup. Remove the stock pulleys and simply install the front sprocket, the spacer and rear sprocket with the included proper length Grade 8 hardware. We also include a specially designed, stainless steel locking tab washer for the rear sprocket hardware. 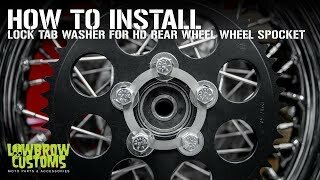 In addition to installing the hardware properly with clean hardware, red Loctite and proper hardware torquing, this locking tab washer physically stops bolts from being able to loosen. 530 chain not included, supply your own or choose one from the 530 Drive Chains here at Lowbrow and we will send it on it's way. This kit is designed to match stock gearing for 2006 & up Dynas. The countershaft (front) sprocket is 25 teeth, and the rear sprocket is 55 teeth, for a 2.214:1 gearing ratio. This means that the countershaft sprocket rotates 2.214 times to spin the rear sprocket one full revolution. The less times the countershaft sprocket has to rotate, the taller the gearing, meaning less power off the line but better high-speed cruising. The rear sprocket has a 2.214 inch diameter center hole to properly fit 2006 and later H-D Dyna rear wheels. NOTE: These are made for use in a stock Dyna swingarm. If the swingarm you are using is a different width, or you are using a non-stock wheel this may affect the rear sprocket alignment. This is for use with a stock with wheel, and is not for a wide tire conversion. Nice kit, very easy to do if you know your way around a garage. Delivered quick no issues. I’d definitely recommend to others. How many teeth on the 06 and up dyna sprocket? 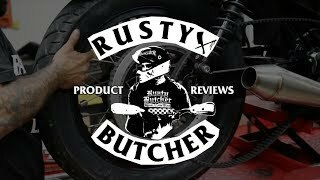 I want to do the chain conversion for my 07 street bob, but want 3-5 more teeth on rear sprocket for torque. Can u set me up with that? Our kits closely replicate the stock drive ratios and we do not have any other tooth count options for the front or rear available for the kit. hi guys, we need a info , we buyed a two kit one for dyna one for sporty. any chain 530 work on it? Thank you .